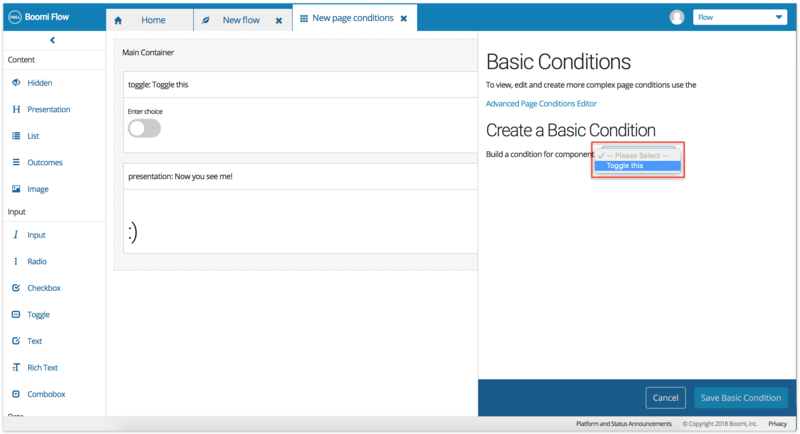 We can use Flow page conditions (which are very similar to business rules) to conditionally vary the components that are shown to the end-users of apps. 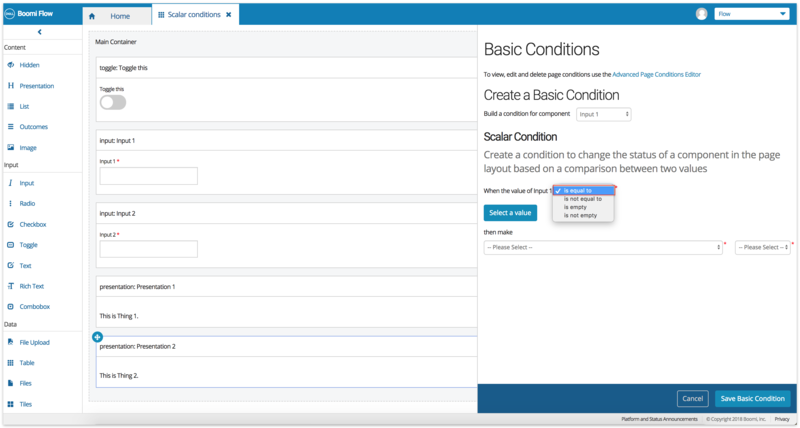 Thus, we can create a dynamic and different experience for our users with the same page layout. We have two different types of page conditions we can create – Boolean and Scalar. Depending on the component we have selected, the drawing tool automatically displays the condition that is applicable, i.e., Scalar or Boolean. Boolean – Lets us create a condition where we can change the status of a component in the page layout when another component is True/False. 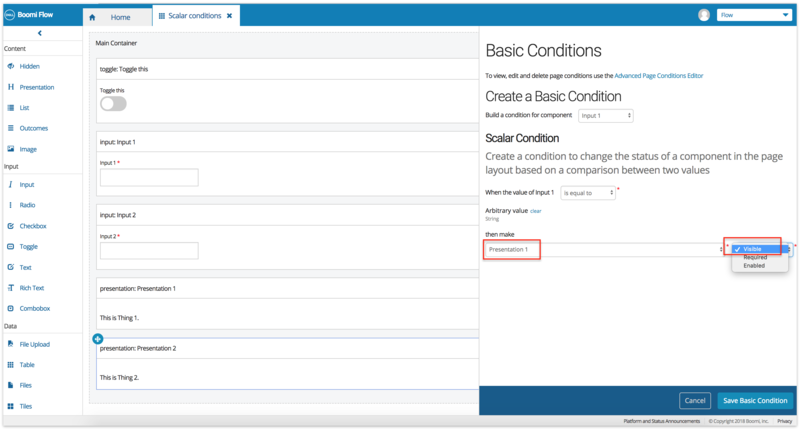 Scalar – Lets us create a condition where we can change the status of a component in the page layout, based on a comparison between two values. We have three options to choose from, if a particular condition is true (or false, as the case may be): 1. Visible, 2. Editable, and 3. Required. As we can guess, the Visible option makes a page component visible to the user if a condition is true/false. 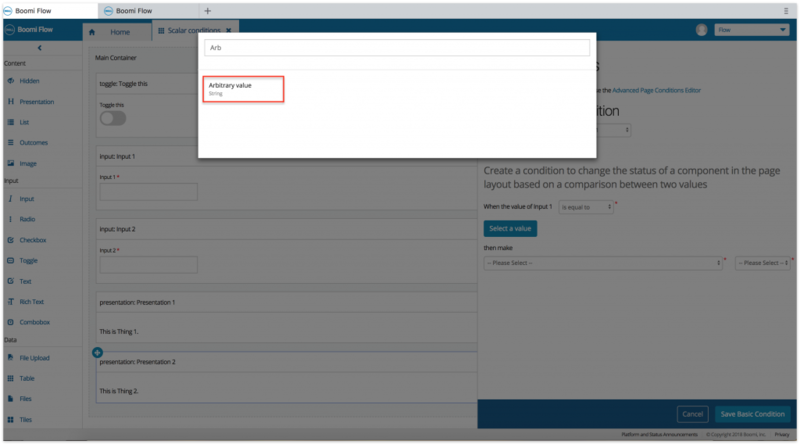 The Editable option makes a component editable if a condition is true/false, and the Required option makes a component required for the user if a condition is true/false. Say, we have a page layout called New page conditions. As we can see, the page has a toggle component, and a presentation component. Click the Basic Page conditions icon on the right-hand-side navigation. This opens a configuration panel. 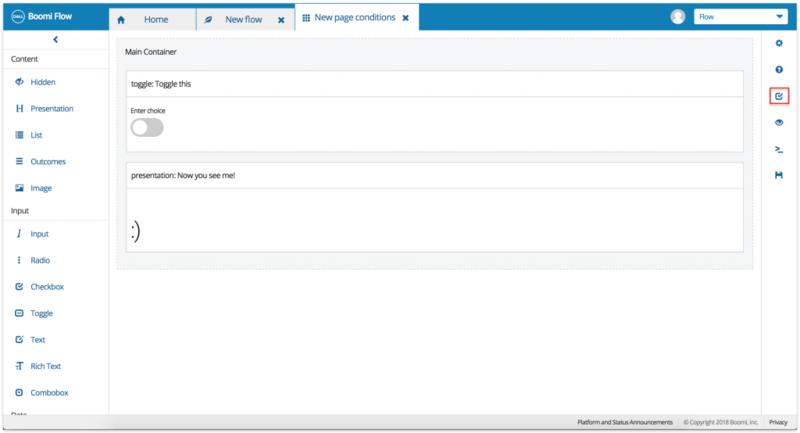 We have the options for creating basic as well as advanced page conditions. 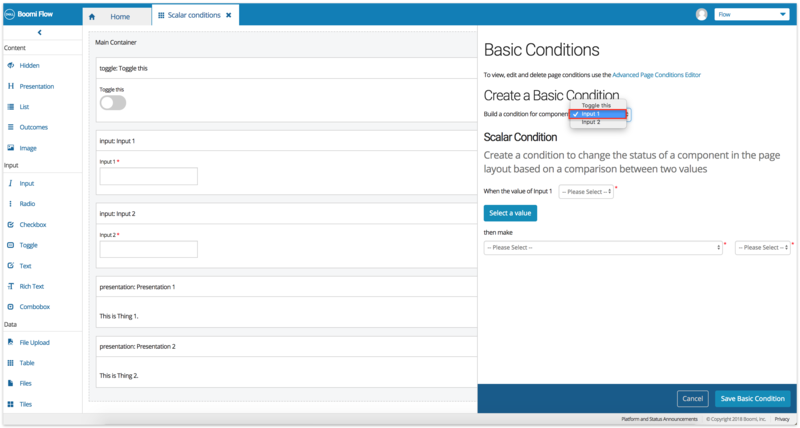 Advanced page conditions (as the name implies) can handle more complex conditions and page rules. 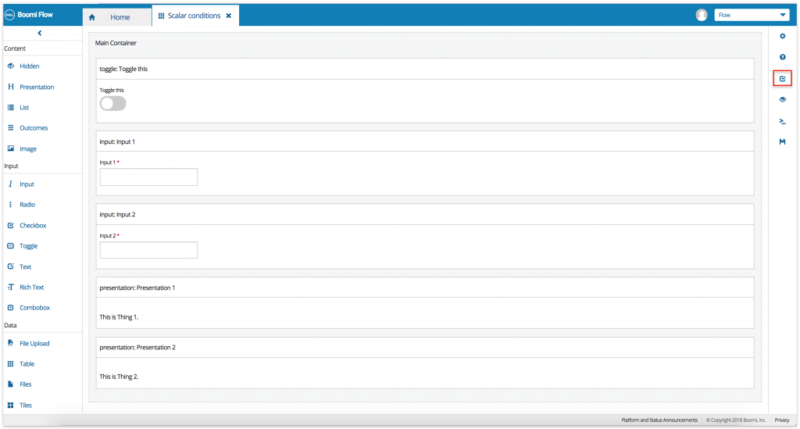 The dropdown menu lets us select the component we want to build the condition for. This opens the configuration options we have. Do we want the condition to be True or False? Which component will be affected by the condition? How will the component behave if the condition is met? 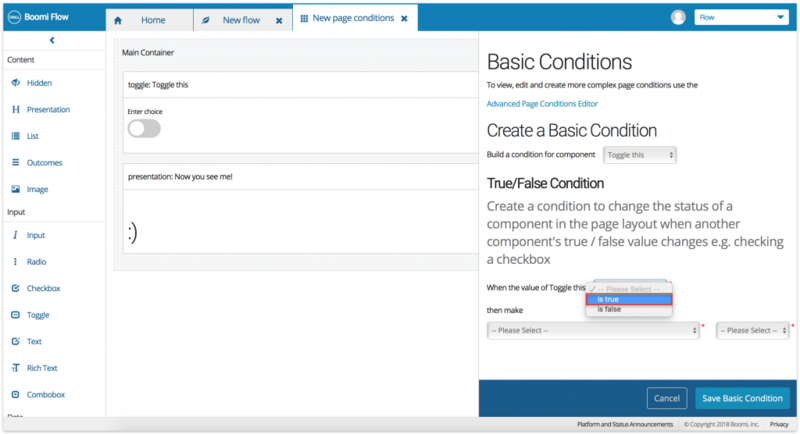 The Visible option makes a page component visible to the user if a condition is true/false. The Editable option makes a component editable if a condition is true/false, and the Required option makes a component required for the user if a condition is true/false. Click Save Basic Condition to save the condition. Let’s say we have a page layout which has a toggle button, two Input components, and two Presentation components. The dropdown menu lets us select the component we want to build the condition for. We will select a component that can support scalar conditions. Let’s go with Input 1 for the purposes of this tutorial. We have four comparison parameters to chose from – is equal to, is not equal to, is empty, and is not empty. Let’s select is equal to. Click Select a value, to select the value we are comparing with. As you can guess, this value can be any arbitrary value. We are going to select Arbitrary value. What happens if the condition is true? We can select a component, and decide how the component’s behavior will be affected. Let’s select the Presentation 1 component. 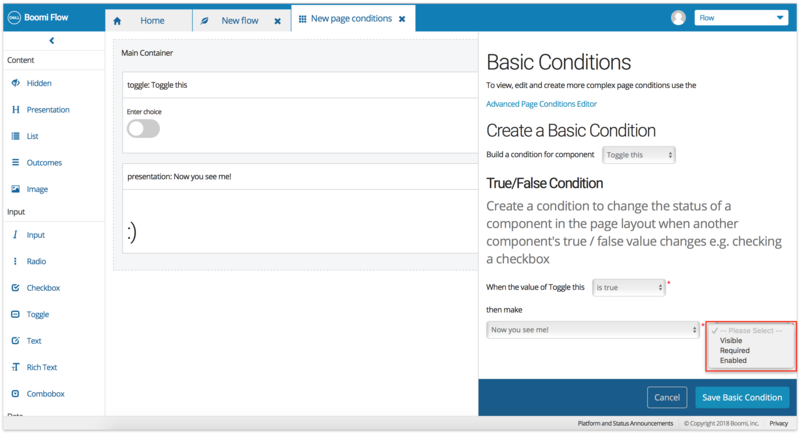 The Visible option makes a page component visible to the user if a condition is true/false. 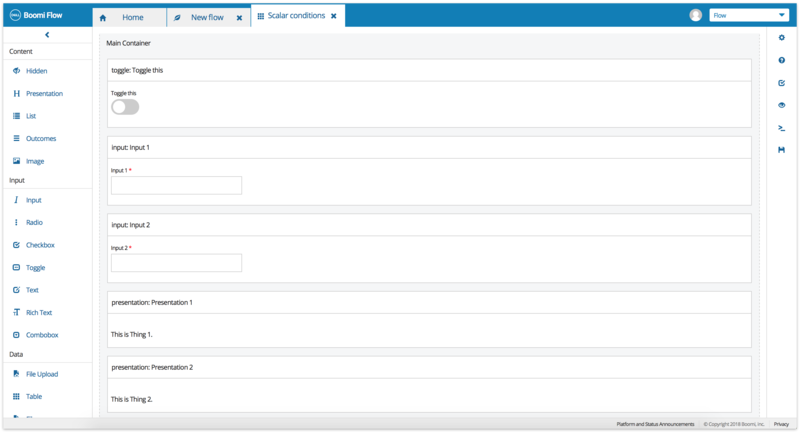 The Editable option makes a component editable if a condition is true/false, and the Required option makes a component required for the user if a condition is true/false. How about, we make this component Visible if the condition is true?